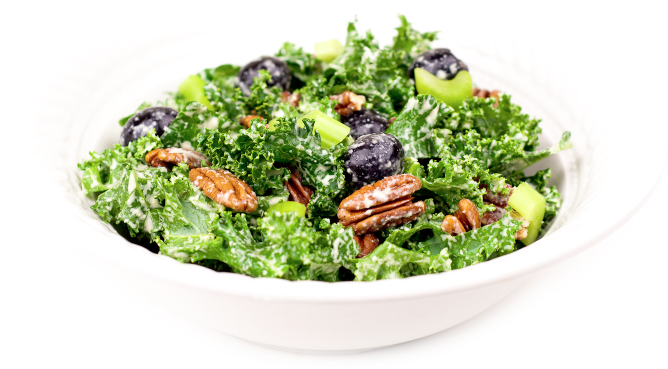 Support your body with the Super Hero of Greens, KALE! A bowl of this kale salad dressed with Rosemary Shallot Dressing is a satisfying, super food-packed meal. Kale supports your body in detoxifying, helps lower cholesterol, reduces inflammation and fights oxidative stress. I consider kale the Super Hero of greens. 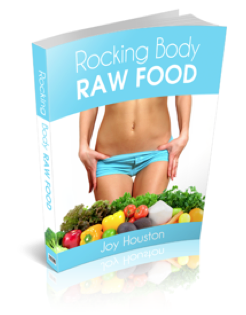 So many of you responded positively to the Cheesy Kale Chip recipe that I thought you might take advantage of more raw food recipes that get this powerful food into your body in delicious ways. Try this one and share your comments with me below or with our Facebook Community. Blend all the ingredients in the Vita-Mix until smooth. Keeps well in the fridge for 4 to 5 days. Note that this also works well to dress a mock potato salad made with jicama instead of cooked potatoes if you want to stick with raw foods. Toss the above ingredients in the Rosemary Shallot dressing and use your clean hands to toss well, lightly massaging the kale to coat all the nooks and crannies of the wrinkled leaves. Enjoy.